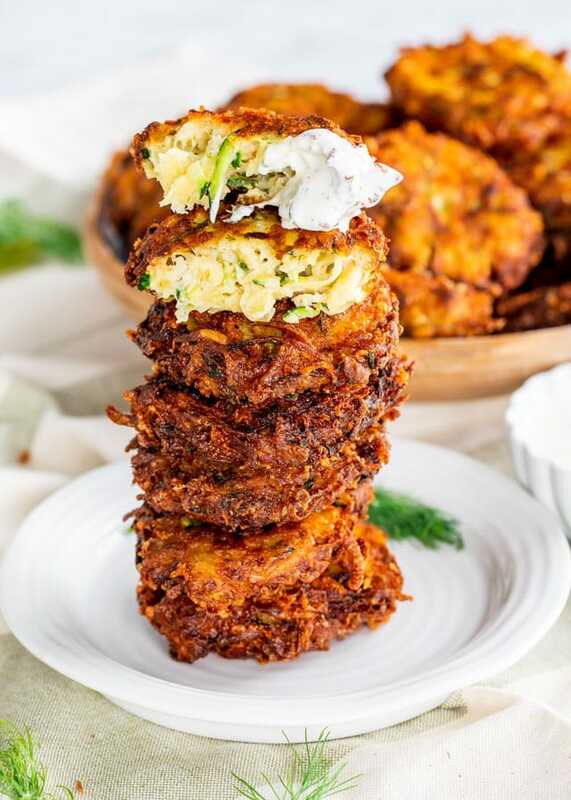 My recipe for Potato Zucchini Fritters is loaded with potatoes, zucchini and mozzarella cheese. They are so good, they’ll be gone before you’re done frying them all. I love fritters and I make them quite often, especially in the fall when there’s an abundance of zucchini in the markets. I wish I could tell you I grow my own zucchini, but I have a black thumb when it comes to gardening. The grocery store will have to do! But I don’t worry about that, because I love going grocery shopping. 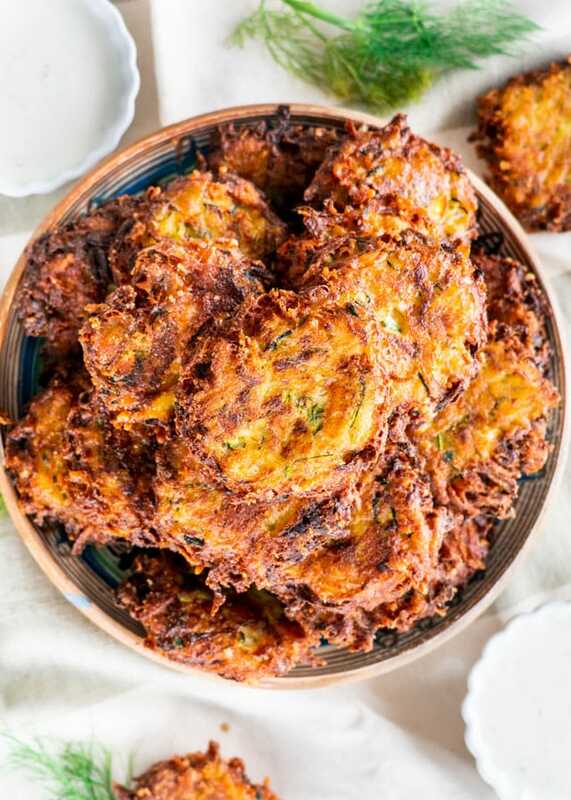 I combined these zucchini fritters with some shredded potatoes as well and these babies are to die for! This recipe is so wonderful because it can either be baked or fried. I prefer mine fried for that ultra crisp exterior paired with the nice soft potato and zucchini inside. 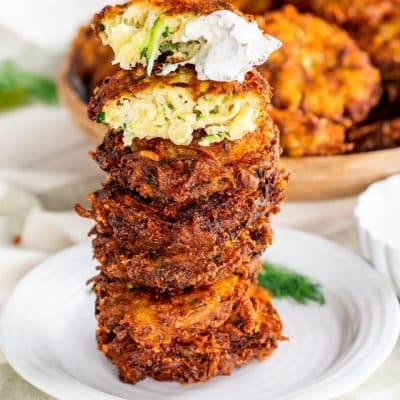 What Ingredients Do I Need to Make Potato Zucchini Fritters? Potatoes – Yukon Gold potatoes are ideal for this recipe. You can also use russets, but they are a little more starchy. Breadcrumbs – Panko breadcrumbs will help give these guys some extra crunch. That’s always my favorite type of breadcrumb! You can also use regular, Italian, or gluten-free breadcrumbs. All-purpose flour – The flour in this recipe is what helps bind our fritters and keep them together. You can use gluten-free flour instead. Hot sauce – I used Frank’s for this recipe to give my fritters an extra zing of flavor. You can use any brand you prefer, or leave it out all together. Eggs – The eggs, like the flour, are used to bind our fritters. Who likes to pick up a fritter just to have it fall apart? Mozzarella cheese – You can, of course, use any cheese you like, though I chose to go with shredded mozzarella, but other options can be Parmesan cheese, gruyere, gouda, even Swiss cheese. You can’t go wrong; cheese makes everything better! Salt & pepper – Season your fritters to your own personal preference. Dill – While you can use fresh or dried, I always suggest using fresh dill whenever possible. The flavor is unmatched! If you don’t like dill, you can leave it out. Other herbs such as basil, oregano, thyme, rosemary, or a blend would be great. Vegetable oil – If you don’t want to use vegetable oil to fry your fritters, make sure you choose a replacement with a high smoke point. Frying is a high temperature style of cooking and we don’t want these fritters to taste like burnt oil! Good options include grape seed, canola, corn, sunflower, and avocado oils. Prepare the zucchini: Using a cheese grater, shred the zucchini. Place it in a large bowl lined with paper towel, cheesecloth, or a kitchen towel. You can sprinkle a little bit of salt over the zucchini to help speed this process up. Let it sit for a few minutes, then squeeze out as much water as you can. Make the fritter batter: Add the zucchini to a large mixing bowl. Shred the potatoes with a cheese grater and add them to the bowl with the zucchini. Add the remaining ingredients, other than oil, and mix well with your clean hands or a wooden spoon. Cook the fritters: Heat the oil in a large skillet over medium-high heat. Use a spoon and drop about 1-2 tbsp of batter into the oil, depending how big you want your fritters. You can also form the batter into a ball with your hands, then flatten it to make a patty. Fry for about 3-4 minutes on each side. Adjust the heat and turn it down if necessary. These fritters make such a great snack, but they also make a perfect appetizer. I love serving mine with ranch dressing, but if you like spicy, serve them with hot sauce, they’ll be delicious. I’ve even served these with salsa before! I know it seems like a bit of a tedious step, but don’t skip it! Zucchini has a very high water content. When heat is applied, all the water comes out like you’re wringing a sponge. All this extra moisture in the middle of your fritters will cause them to fall apart. Can You Bake Potato Zucchini Fritters? Scoop the fritter batter onto a parchment lined baking sheet. If you want, for extra crunch, give them a quick spritz with some cooking oil. Bake for about 20 minutes, flip, spritz, and bake for another 10-15 minutes or until they’re golden brown. That’s it! It really can’t get any easier than that. Make sure the oil is nice and hot before you drop them in. You can either use a kitchen thermometer, or you can drop a very small piece of batter into the pot to test it. Squeeze out as much water as possible from the zucchini to make sure your fritters have the perfect consistency. Don’t overcrowd the skillet! Make these fritters in batches so they have enough room to float around and cook. Store your fritters in an airtight container or large ziplock bag. They will last in the fridge for 4-5 days or in the freezer for 2 months. To reheat, bake them at 375F until they are warmed through. This will take about 10-20 minutes from the fridge, and about 30-40 minutes from the freezer. My recipe for Potato Zucchini Fritters is loaded with potatoes, zucchini and mozzarella cheese. They are so good, they'll be gone before you’re done frying them all. Line a big bowl with paper towels. Grate the zucchini in the prepared bowl, do one zucchini at a time, then strain all of the water from them using paper towels. Alternatively, you can place the grated zucchini in a colander over the sink, and add about a tsp of salt to the zucchini. Gently toss, then using paper towels, drain the zucchini. 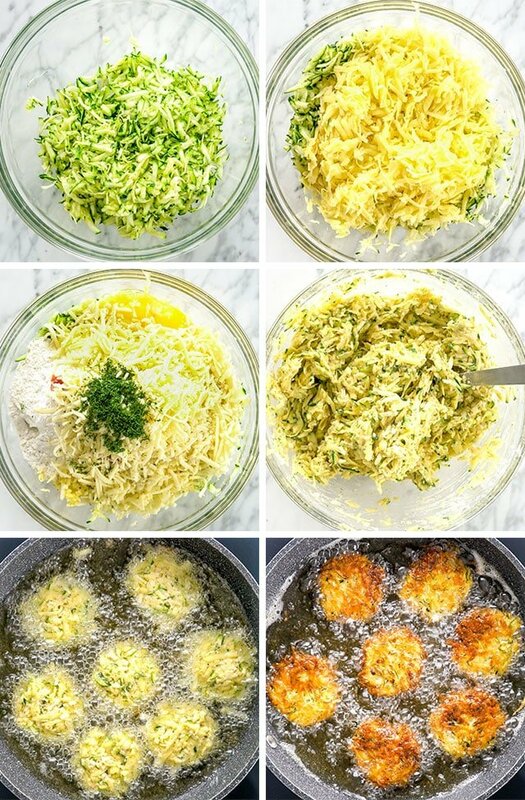 Add the shredded zucchini to a large bowl and in the same bowl grate the potatoes. Add the remaining ingredients to the bowl and mix well with a spatula or with clean hands. Heat the oil in a large skillet over medium high heat. Take a spoon and drop a tablespoon of the potato zucchini mixture in the skillet, or use your hands to form a ball then flatten it for a patty. You can also use a 1/4 cup measuring cup, as seen on the video. Turn the heat down to a medium. You can fry about 7 to 8 fritters at once. Fry on both sides until golden brown, about 3 to 4 minute per side, then transfer them to a plate lined with paper towels. Repeat with remaining fritters. Serve warm with ranch dressing or salsa. This recipe yields about 20 to 25 fritters. If you find the mixture is too wet, add a bit more flour to it. To get as much water out of the zucchini, add a bit of salt to the shredded zucchini and let them rest for about 5 minutes before squeezing out all the water. To bake these, preheat the oven to 400 F degrees. Line a baking sheet with parchment paper. 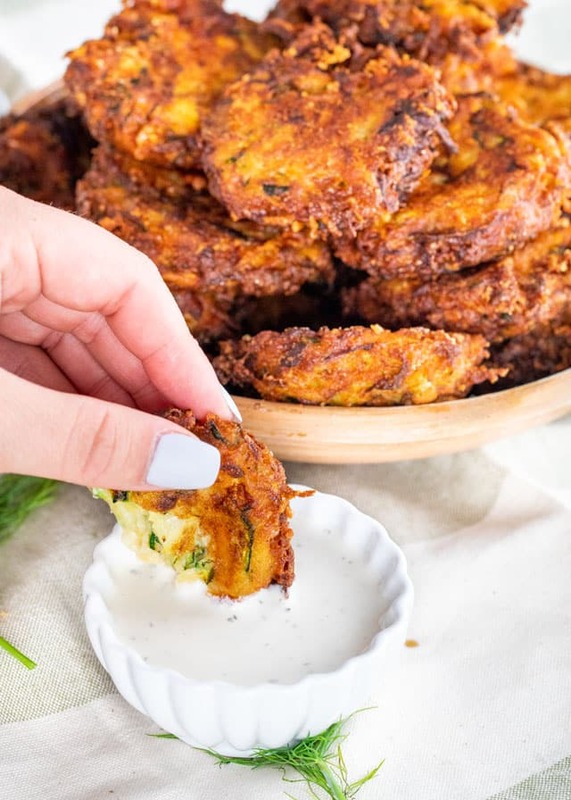 Place potato zucchini fritters on the prepared baking sheet and bake for about 20 minute, flip them onto the other side and bake for another 10 to 15 minutes or until golden brown. Originally shared May 2012 and updated with video and new pictures. This recipe looks promising! I was wondering if I could bake them instead of frying them? I’ve never tried baking them however they might work. I would cover a baking sheet with silpat or parchment paper and bake at 400 F degrees for about 10 to 15 minutes per side. Could you freeze these for a make ahead preparation? I would prefer to bake them. Hello Jo. Thank-you for this recipe. I substituted spring onions (scallions?) for the dill in these courgette/zucchini fritters for a Friday feast. 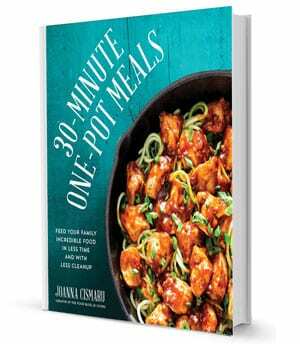 Your recipes result in food that nourishes the body and soothes the soul. You are a blessing! Made these for lunch today; I thought they were great, but I found I needed to cook them a bit longer – more like 5 minutes per side. I think I’ll add some grated onion in them next time, too! I can’t wait to try these, I love fritters! I’m a novice cook and I made this last night for my boyfriend and the fritters turned out so good, my boyfriend was super impressed. Thank you! Thank you for your kind words. 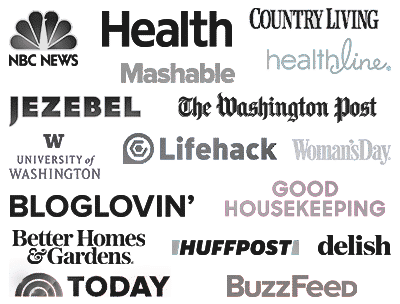 Have you read my post on how to start your own blog? http://www.jocooks.com/how-to-start-a-food-blog/ Give that a quick read first and if you have any further questions let me know.